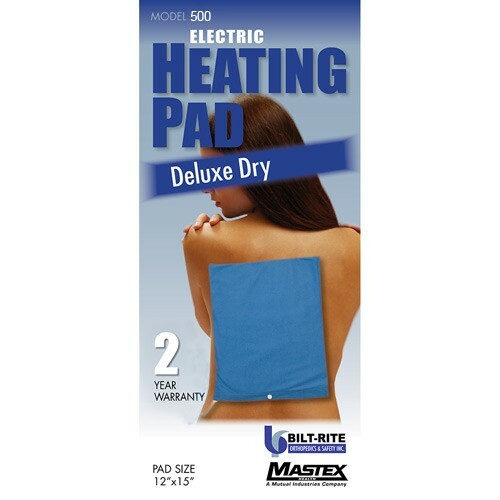 Bilt-Rite 500 Economy Dry Heat Pad is a great hot/cold therapy device for several types of aches and pains. The removable, washable is made of a soft, comfortable cloth that makes the pad convenient to use at any time. The heating pad has a convenient switch with three heat settings to make it easy for you to find the optimal temperature for your needs. It is 12 inches by 15 inches, providing you with a sufficient size to apply heat to a large area at once. Enjoy soothing heat and pain relief with a Bilt Rite Dry Heat Pad!